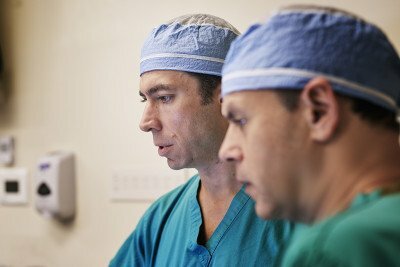 When spine surgery is recommended, neurosurgeons Ilya Laufer (left) and Mark Bilsky work together to create a customized care plan. Surgery is not a common spine tumor treatment at Memorial Sloan Kettering — only about 10 percent of patients with spine cancer get surgery. If your treatment team recommends it, your surgeon will remove as much tumor as possible while taking every precaution to protect your spinal cord and other major nerves. We recommend this approach if there’s spinal compression, the tumor won’t respond to conventional radiation therapy, or there’s spinal instability that minimally invasive surgery can’t fix. At MSK, you’ll have access to surgeons who are among the most experienced in their field — our surgical teams perform about 180 spine surgeries each year. Many of our surgeons have pioneered techniques and developments that have made spine surgery a much safer, more effective option. Our neurologists work side by side with your surgical team to identify any changes in your neurologic function that may come up during surgery. The neurologists stimulate nerves involved in movement and other key functions. They measure and record how your nerves respond. This helps your surgeon keep the nerves safe. Our neurosurgeons use this procedure to remove spine tumors and reinforce your spine through an incision in the middle of your back. The procedure reduces the risk of complications and shortens recovery time, helping you to receive radiation therapy or other treatments sooner. This surgical technique is used to remove the tumor in a single piece. En bloc resection is often used to completely eliminate primary tumors, such as giant cell tumors, low-grade chondrosarcomas, and chordomas that are located in the bones of your spine or next to your spine. If you have a metastatic spine tumor (a tumor in the spine that began elsewhere in your body), some surgical procedures can help stabilize your spine, reduce pain, prevent paralysis, and increase mobility. spinal cord decompression This technique relieves pressure on your spinal cord and nerve roots. Decompression also creates enough space so that you can receive high-dose radiation without risking injury to your spinal cord. spinal instrumentation Your surgeon attaches pedicle screws and rods to your spine to redistribute stress on and align your bones. This technique is usually used if you have significant spinal cord compression, a collapsed vertebra, or a burst fracture that kyphoplasty can’t repair. When possible, your surgeons will use specially designed screws, a less-invasive technique. If your tumor has an unusually high number of blood cells, you may lose more blood during surgery. Spinal angiography can help reduce how much blood you lose. This procedure involves an injection of contrast dye and then taking an X-ray. This helps identify the blood vessels. During embolization, an interventional radiologist injects small beads into these blood vessels to keep them from bleeding.